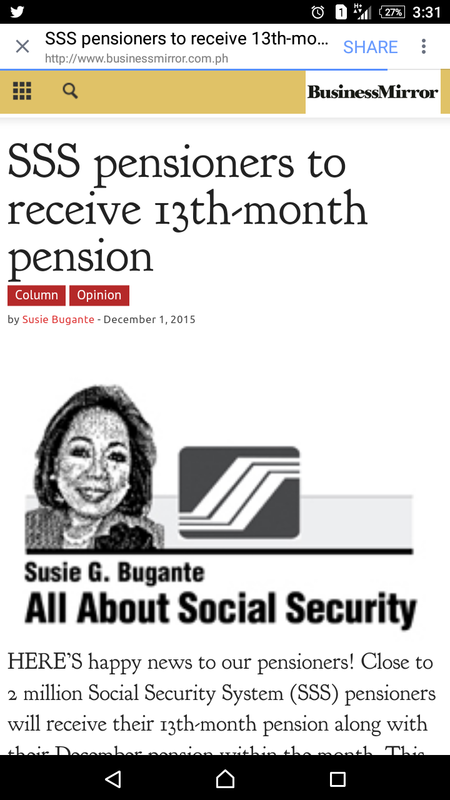 According to Ms. Susie Bugante of SSS, this month of December, SSS will give 13th month pension to its almost 2 million pensioners. The 13th month pension will be equivalent to their monthly pension benefit, but it does not include career allowance for those receiving disability pension. Those receiving retirement pension, and death beneficiary of their deceased spouse will be entitled to receive two 13th month pension, as part of their retirement pension and another as death beneficiary. "HERE’S happy news to our pensioners! 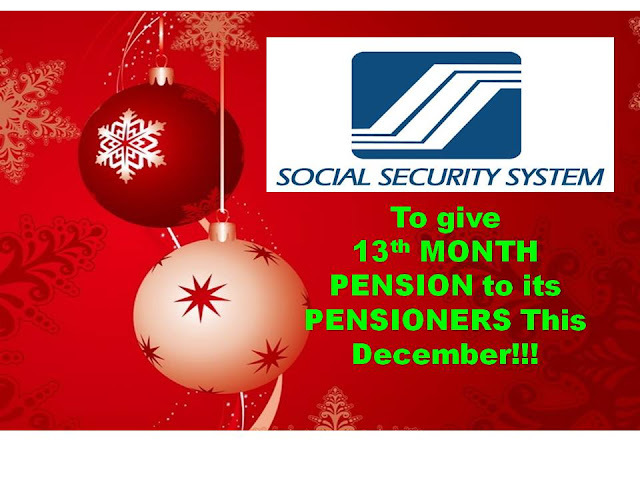 Close to 2 million Social Security System (SSS) pensioners will receive their 13th-month pension along with their December pension within the month. This is part of the annual tradition began in 1988 as the pension fund’s way of enhancing its pensioners’ benefits. The 13th-month pension of retirees and survivor pensioners is equal to the amount of their regular monthly pensions, while it excludes the career’s allowance for disability pensioners. Children receiving dependent’s pensions are also entitled to the 13th-month pension. Partial disability pensioners should have received a full year’s pension for them to be entitled to the extra month pension. SSS members or their beneficiaries can withdraw their December and 13th-month pensions on a schedule based on the members’ contingency dates for retirement, disability or death. Based on experience, however, most banks allow pensioner-depositors to withdraw their benefits earlier than their contingency dates to enable them to enjoy the Christmas season. Retirement pensioners who are, at the same time, death beneficiaries of their deceased spouses, who were members of the SSS, are entitled to separate 13th-month pensions under the two benefits. What about those pensioners who availed themselves of the first 18 months advance pension and the three months advance pension for calamity victims, are they still entitled to the 13th-month pension? This is a question that pensioners often ask. The answer is yes, they are entitled to the 13th-month pension. Thus, they can expect to have this amount deposited in their account within the month. For those pensioners who are still receiving their pensions in checks, they can expect to receive their checks within the month of December. Regardless of the date of settlement of a retirement, death or total disability claim, the pensioner is entitled to a full 13th-month pension when the month of December comes along." For more information about the Social Security System (SSS) and its programs, call its 24-hour call center at (632) 920-6446 to 55, Monday to Friday, or send an e-mail to member_relations@sss.gov.ph. HOW IS CHRISTMAS IF YOUR PARENTS ARE OFW'S?